the most impressive when we were much closer. We were dealing with some pretty hazy conditions due to the fires that were burning in Canada and Idaho but we made the best of the situation. Post processing included a lot of use of the De-Haze slider in Lightroom! What was amazing to me was the fact there was snow on some of the peaks in August! It was not exactly cool during the day there! Peaks with snow in August! We found that the closer we were to the peaks, the less haze was visible but sometimes being away from them gave some very dramatic images! The image below was enhanced by the haze as it gave a very layered look to the peaks. Another interesting way to shoot these mountains was with reflections. In my post on Schwabacher Landing, it was all about the reflections. 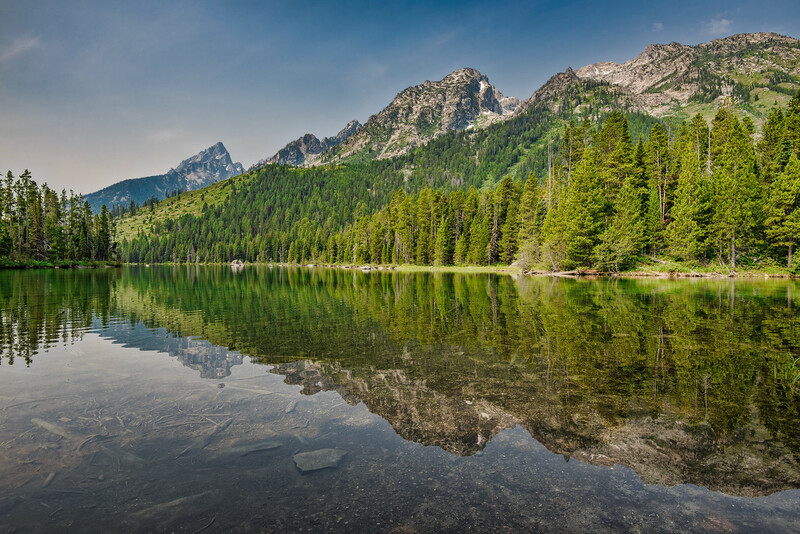 We went to two lakes that are next to the Grand Tetons to see if we could get some closer reflections. 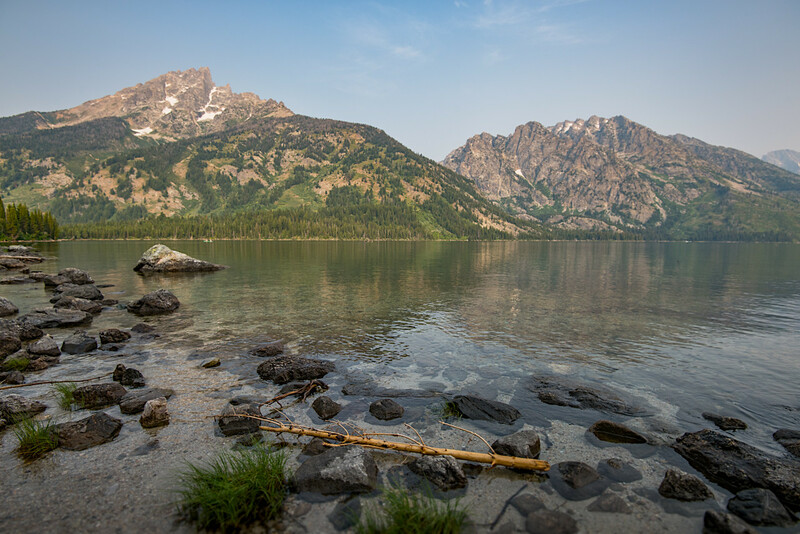 Jenny Lake is a fairly large lake that on this day was not very cooperative for reflections. There was a slight breeze and a ferry that was crossing the lake every few minutes off to the right of this view. That caused the water to be a bit too rough for a great reflection. So we decided to go down the road a bit farther to String Lake to see if that would be better. This lake was much smaller, only canoes and kayaks were used here, and the breeze was non-existent! The water was so clear that that interfered with the reflection some (I did not have my polarizing filter) but I still liked the reflection I was able to get here. This was another location that I just had to pull out my infrared converted camera and get a few images. I thought a little color would be fun! 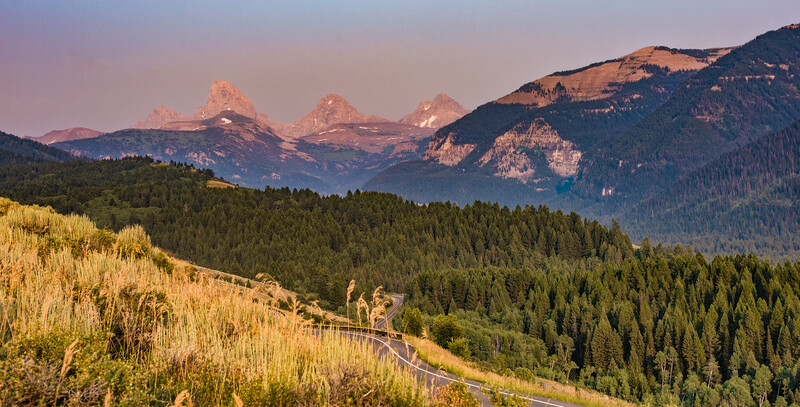 We really wanted to get a sunset shot but the haze and weather really didn’t give us much in the way of opportunity until this one evening as we were heading back to Tetonia. The sky was so so, but we decided to stop and see what would happen! We stood facing the Tetons for over an hour and this is the result! Waiting paid off! The Grand Tetons gave me even a bigger thrill than seeing Mount Hood in Oregon. What was so astounding to me was we drove and drove and these mountains never seemed to end! 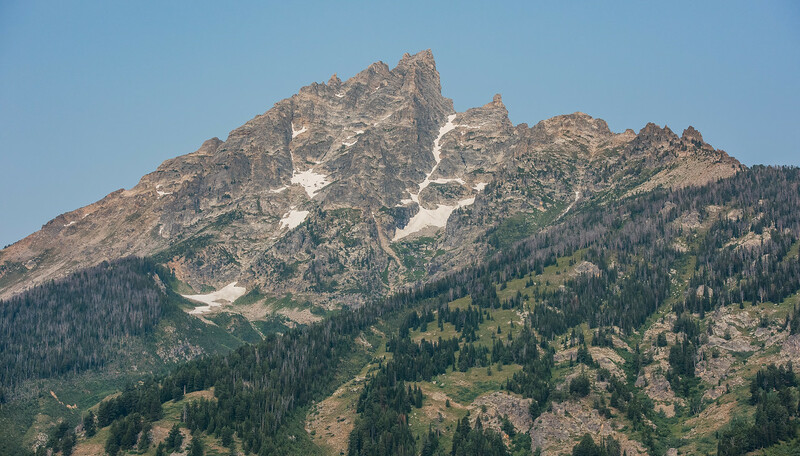 If you go to this area be sure to check out the Grand Tetons National Park. It is right next to Yellowstone National Park so visiting both is a must! 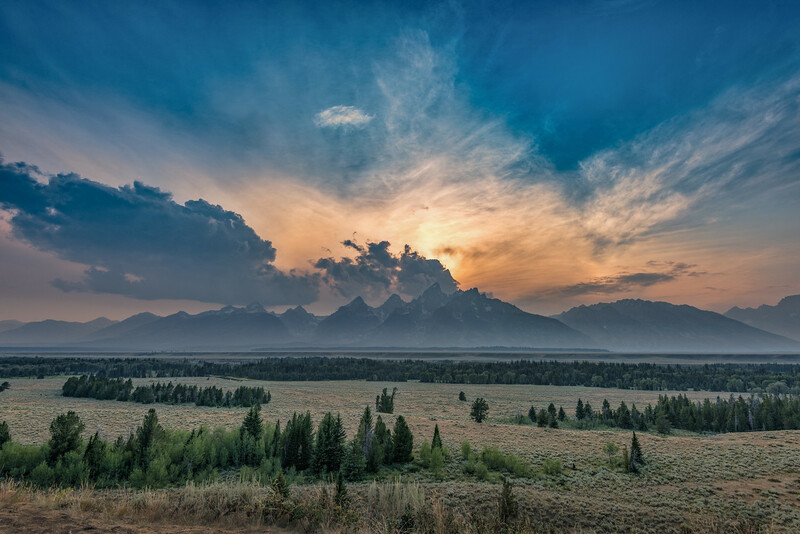 The last post on this wonderful journey is about an iconic location (for photographers at least) again in the Grand Tetons National Park. Watch for it coming soon! 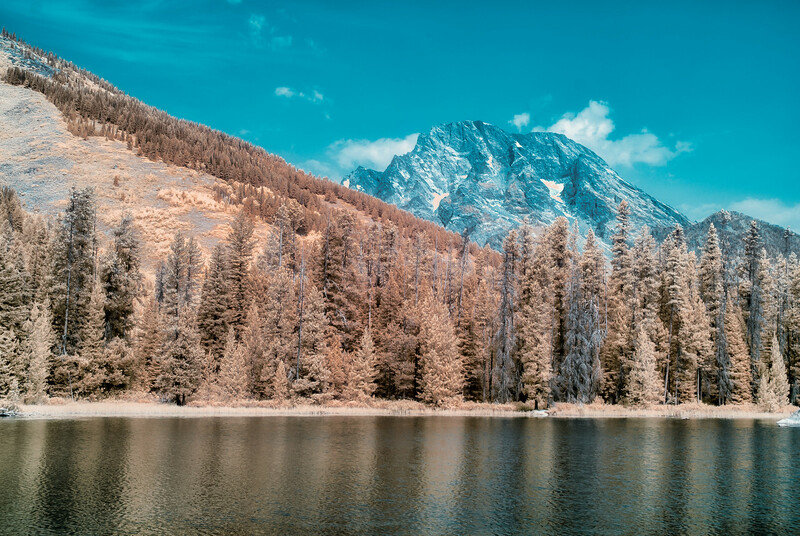 Please visit my gallery for these and additional images of the Grand Tetons! 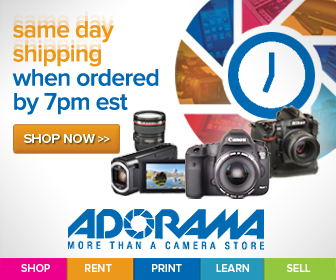 I primarily used my Nikon 16-35mm lens for these images! It was made for these kinds of landscapes!